One full-day and five half-day workshops are being offered during a pre-conference on February 12. These workshops deal with a variety of assessment issues that require “hands-on” experience and demand more than the 75 minutes available in the conference clinic sessions. Registration for these workshops is separate from registration for the conference itself. Meals are included in the workshop registration fees. Extensive materials are provided for workshop participants. SCECH credits are available for each workshop attended. This year’s conference will feature four plenary sessions focusing on early literacy development, Michigan’s state assessment components, English language acquisition, and disciplinary literacy, plus 36 clinic sessions on a variety of assessment issues and topics. 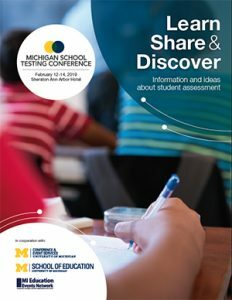 SCECH credits are available for each workshop and session you attend during the Michigan School Testing Conference. Overnight rooms are still available for $119 a night at the Sheraton Ann Arbor Hotel, 3200 Boardwalk Drive, Ann Arbor, MI 48108. To book a room, call (734) 996-0600. Ask for the “MSTC” block of rooms when you call. Registration fees include breakfasts, breaks and lunches plus Reception on Wednesday afternoon.